Milton has a wonderful secret. And now you can discover it too! Milton is a happy kid until a school bully starts to push him around. Now he worries all of the time about what the bully will do to him when he’s at school. But Milton encounters a few situations (including a very special lesson from Snuggles the cat) that help him understand a very important thing: the only way to be happy is to live in the Now. For the first time, Eckhart Tolle and co-author Robert S. Friedman bring the concept of the bestselling The Power of Now to a story for children. 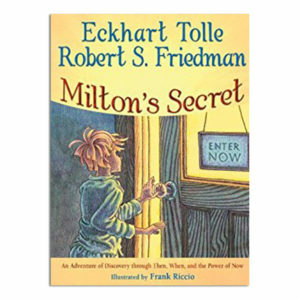 Thought-provoking, beautifully illustrated, and a wonderful teaching tool for parents, Milton’s Secret will inspire and help children who must face difficult encounters at school, on the playground, and everywhere.